California wine country is in bad shape right now. The region is national news, and for all the wrong reasons as fires sweep through wreaking absolute destruction. The latest death count is 40 and hundreds are still missing. Video footage and pictures make it clear that the results of the fires are, in many places, the complete elimination of neighborhoods. While communications are down in the area making reaching the missing people via phone and email nearly impossible, it is incredibly unsettling for those of us with friends in the area whom we still haven’t heard from. Worst of all, the fires continue to burn and it will be days, likely weeks, before we have a full sense of their human cost. There will be a number of various fundraising efforts to help the communities affected by the fires rebuild. A few are already underway. Here’s one if you’d like to help those who’ve fled their homes, with only what they could grab as they ran from the flames just feet away, to feed, clean and cloth themselves. “Wineries that burned down lost not just their 2017 wines, but also their 2015 and 2016 vintages of reds aging in barrels or bottles but not yet released. 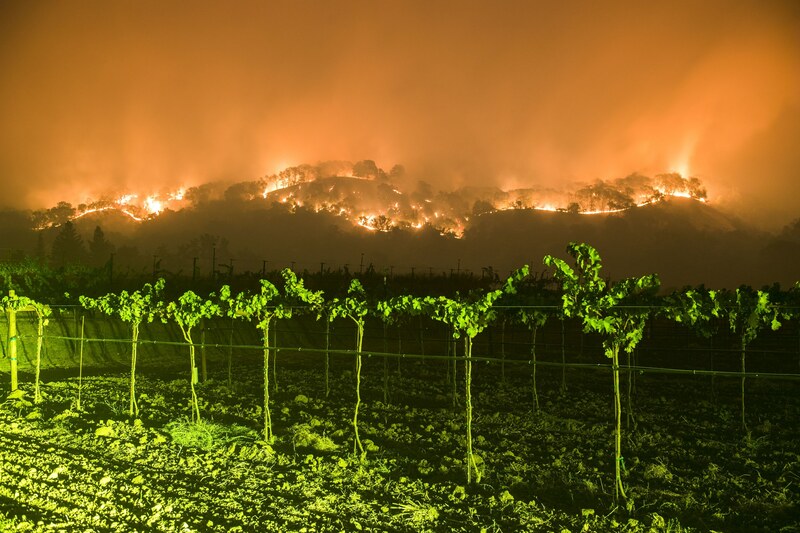 Even wineries that were spared may see their wines affected by smoke. Extended power outages may also affect wines in the cellar as they rise in temperature. And future vintages could be affected – destroyed vineyards may take several years to recover. I’m trying to figure out a way to bring this around to my review of three wines sent to me earlier this year by Hess Collection. In a world in which California isn’t burning, there is no way that they or I thought reviews of their wine would end up in the same post as a conversation about fires destroying the lives and land around them. However, I’m going to do it because, as Dave intimated, the story about the affected people includes their wine. One way of supporting the wineries that have been or will be affected by the fires is to buy their wine to help them remain financially afloat and keep their employees, who aren’t in the business to get rich, on payroll. As Dave asked in his piece, “[what] about the winery workers who live in the valley, or the migrant laborers who came north for the harvest?” These people are likely to be among the most negatively impacted as affected wineries are forced to cut back until things turn around, which will be a multi-year process for many. Any wine writer with a decent moral compass includes some kind of disclaimer on their website for those interested in sending trade samples that says, effectively, ‘just because you send me free wine doesn’t mean I’m going to like it and doesn’t mean I’m going to write good things about it.’ So it’s very rare for wine writers to suggest any quid pro quos to the sources of their samples, let alone to do it publicly as I’m about to do. I’ve chosen to feature Hess in this post for three reasons. First, because they sent me three good wines that under any circumstances are worth drinking, and I’ve given them all positive reviews, which I’d do even if there weren’t any fires. Second, because Hess has already announced that they are giving $25,000 to help fire victims and are encouraging others to give as well. And third, the fires aren’t out yet, and in fact are quite close to the winery itself. Below the reviews is a list of wineries that have reported an impact. My request to consumers who are looking for ways to help: donate money to relief efforts and then please go buy their wines. My request to wineries: please do what you can to help your community get through this. Whatever you do for them, you’re going to to get it back ten-fold. The following list of affected wineries comes courtesy of the Mercury News and was last updated at 6am on October 14th. Segassia Vineyard, 3390 Mount Veeder Road, Napa: A company spokesperson confirmed that the winery owned by the Cates family has burned. White Rock Vineyards, 1115 Loma Vista Dr., Napa: Owned by the Vandendriessche family since 1870, the winery confirmed it was destroyed by the fire that ravaged nearby Soda Canyon Road.